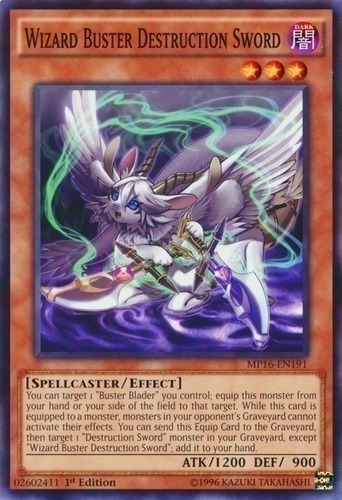 You can target 1 "Buster Blader" you control; equip this monster from your hand or your side of the field to that target. While this card is equipped to a monster, monsters in your opponent's Graveyard cannot activate their effects. You can send this Equip Card to the Graveyard, then target 1 "Destruction Sword" monster in your Graveyard, except "Wizard Buster Destruction Sword"; add it to your hand.